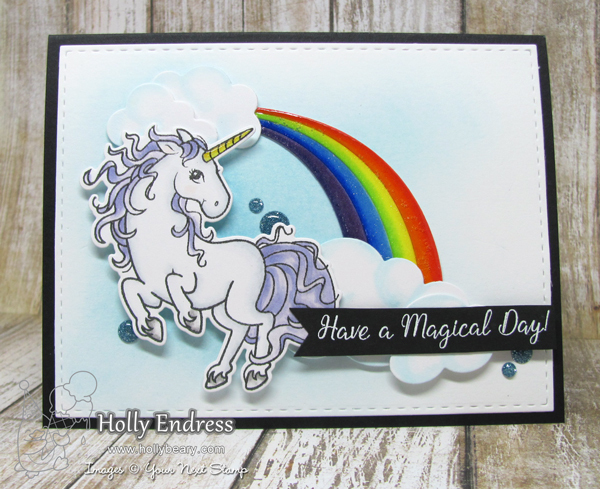 Hollybeary Creations : Have a Magical Day! Happy Friday!!! Who's ready for the weekend? We have another round of Inspiration on the Your Next Stamp Blog today using this week's Challenge. 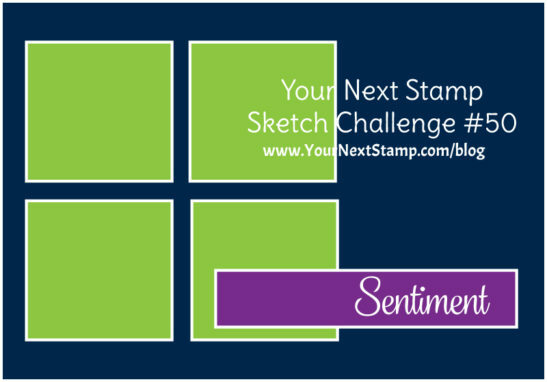 There's a great Sketch and Color Combo to choose from or you can mix them up together. I'm using the Sketch this week and the Magical Unicorn Stamp & Die set. I used the shapes and image as the squares in the Sketch.. So you could say this is my take on it..lol I created a blue background on a piece of watercolor paper with some Tumbled Glass Distress ink. The I die cut the Panel with the Large stitched rectangle die then I adhered the panel to a Black card base. 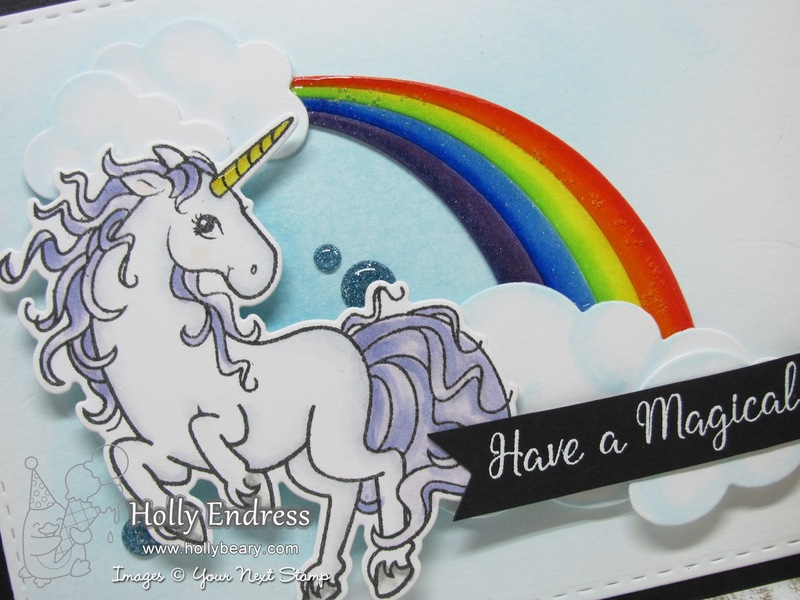 I die cut the rainbow and cloud images using the Rainbow Fun and Puffy Clouds Die sets. I colored the rainbow stripes and added some shading to the clouds with Copic Markers and then I adde some Clear Wink of Stella to the rainbow stripes. For some extra shine I added some Glossy Accents to the rainbow and the unicorn horn. I stamped the unicorn onto some White card stock using the YNS Olive Black ink and colored it with Copics. I used the coordinating die to cut it out. Everything is adhered with some Foam tape. I stamped the sentiment onto a piece of Black card stock and heat embossed it in White. Then I used the Fishtail/Banner Die one set and adhered it over the clouds. I wanted some more blue so I added some of the Cosmic Crush Sparkly Gumdrops around the background. Head over to the Blog for more projects from the Design Team using this week's Sketch and Color Combo. 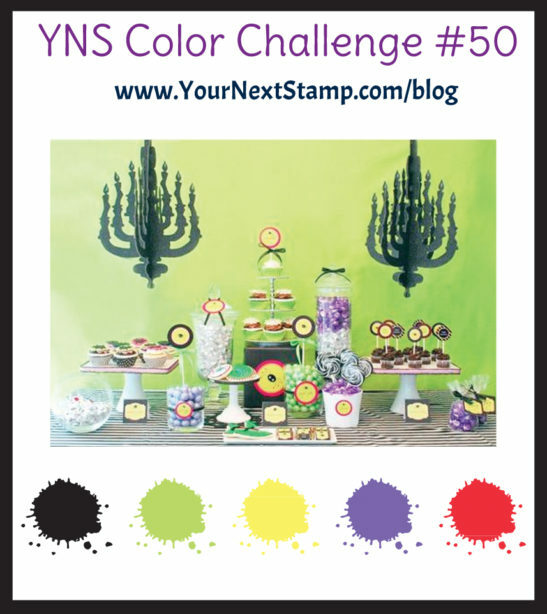 Be sure to join the Fun for a chance to win a $15 GC to the YNS Store.. 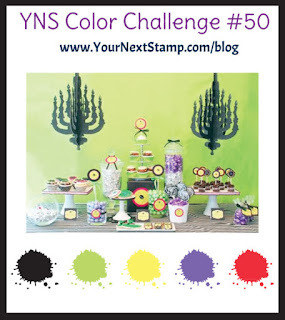 If you are picked and your project uses YNS products you can win $20.